Having cycled pretty much from one side of Central Asia to the other I thought I would write a post with some hopefully useful and possibly interesting information on the region. The areas within the area I have experience of include Western Kazakhstan, Uzbekistan, South Central Kazakhstan and far northern Kyrgyzstan. Nothing. I didn’t see a single thing in Kazakhstan that I would describe as a sight. Almaty seemed a nice city. I’m sure there are some places worth visiting I just didn’t pass through them. Except for Beyneu…I loved Beyneu. That said riding from Shymkent to Bishkek was very beautiful with the Tian Shen mountains a permanent companion on the right hand side. Khiva, Bukhara and especially Samarkand were worth visiting. Wouldn’t particularly recommend Tashkent or Nukus. Ala Archa and Issyk Kul were points of natural beauty worth visiting. 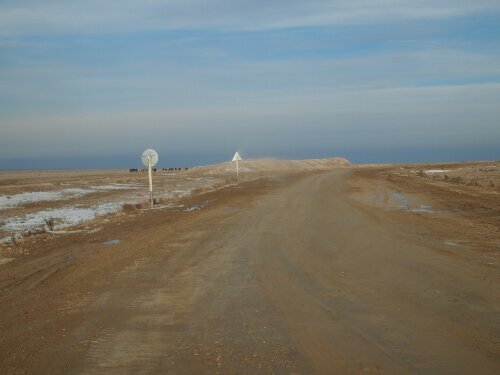 For the most part the roads in Central Asia have not been as bad as I expected. That said there have been places where the term road would have to be applied very loosely to the muddy track that I was riding on. The desert around Beyneu easily had the worst road I have seen. That is actually an OK portion. Away from the desert the roads in Central Asia have generally been good – there are even stretches of very nice smooth highway. The only issue is that these don’t tend to last and one minute you’ll be flying along and the next moment you’ll be dodgy potholes or riding on packed mud for a portion where construction is underway. Basically when riding here you need to be ready for anything. Also off the highway and in and around small towns the roads can be really really awful. If you are foolish like me and end up riding across Central Asia in winter then I would recommend considering some form of winter tires. Ice can be quite the problem and I took quite a few tumbles on highways that had effectively turned to glass. Also there can be snowfall to contend with. This isn’t of course an exclusive list and more reflects where I know there were shops of either type. If I don’t mention one in a city or country it doesn’t necessarily mean that there wasn’t one. Caravanistan has a good section on this as well. Aktau – had a good outdoor shop where I was able to pick up high quality extreme cold weather boots, good gloves and a decent thermos. They had a lot of other kit of various types in there as well and it was very useful for crossing the desert. Tashkent had some good mechanics but was low on parts. See caravanistan. Bishkek had lots of outdoor shops with some quite good kit but some OK bicycle shops. Almaty had many outdoor shops and some good bike shops as well. As a rule there are very few road rules in central Asia. In fact I often got the impression that the only rule that anyone followed was ‘Yield to no one, unless their vehicle is bigger’. That said on highways probably 85% of drivers gave me extra room and and were quite courteous. Of the remaining 15% most cut it a little close but not too dangerously – there were one or two who I felt came deliberately too close as they resented the fact I was causing them to slow slightly. Buses were generally the worst class of vehicle, bus drivers were terrible for getting too close. Whereas I felt that truck drivers generally went out of their way to make sure I had room. They’d often honk support as well. Accommodation has seldom been a problem for me while travelling and I have been able to find somewhere to sleep inside pretty much every night, this has been true even in the deserts of Uzbekistan and western Kazakhstan. In towns of a certain size there are generally guesthouses to stay at. These are known as either Гостиница (gostnitsa) or in Kazakhstan: қонақ үйі. Most are reasonably priced and of reasonable quality. Even in small places people seemed willing to rustle up a ‘guesthouse’ or at least somewhere you could sleep if you were willing to pay. In Kazakhstan they seemed to be between 2000tenge and 3000. In Uzbekistan there was a wider range and I got ripped off in a couple of smaller towns. In big tourist places like Bukhara there is a wide selection of really very nice B&Bs that often do excellent breakfasts. Outside of towns I found that cafes were good places to sleep. Generally in Central Asia cafes have a raised area where people sit cross legged to eat. These were generally padded and there were normally blankets and cushions available as well. Across the deserts in Kazakhstan and Uzbekistan there seemed to be small cafes at regular intervals that could be used. In places where I couldn’t find cafes or guesthouses I found that asking to camp near to someone’s house was an option. Every time I did this, the people were kind enough to invite me inside, which gave me a good chance to interact with locals as well as giving me a warm bed. When I say bed I mean piece of floor. Aktau: Hotel Keremet in microrayon 3. It is I understand the only budget option in Aktau – it isn’t great but at the price I was happy. Beyneu: Hotel Aknur, good value, new and clean. Will knock money off if you plug the place. Nukus: Hotel Jipek Joli. Very nice, friendly staff but on the pricey side. Khiva: Alibek B&B. Very close to the Old City – good value, good breakfast and nice owners. Bukhara: Sarrafon B&B. Good breakfast, nice people, nice rooms, good location. Samarkand: Bahodir B&B: A bit rundown but good value, very good value food and very nice staff. Tashkent: Gulnara Guesthouse. Nice, new and clean with pleasant staff. Bishkek: Interhouse hostel. Really great place. Stayed almost a month here. Very clean and homely with lovely staff and interesting breakfasts. The food in Central Asia, in my opinion, is pretty awful. There is not a huge amount of variety and the quality of ingredients tends not to be great. In the major cities things are of course a lot better and I found it possible to get some nice food in Bishkek and Tashkent for example. Uzbekistan had noticeably the worst food and I’d find that menus were often a wish list rather than what was on offer. Manti: dumplings with veg, potato or meat. Lagman: noodles of various types, including with soup or fried. Soups: the most common soup outside of cities seemed to be greasy broth with unidentified meat floating in it and hopefully what was a potato. Shashlik: Meat kebabs, chicken, mutton or beef and normally pretty good. There were of course a few other dishes but I found that these ones were widely available and pretty safe. Of the three countries I have visited, two require some form of registration. In theory Uzbekistan is more proscriptive and should be more annoying – in practice I found Kazakhstan’s registration regime far more of a chore. Kyrgyzstan doesn’t require registration or even visas for citizens – at least I guess not as no one stopped me a the border. In Kazakhstan you are required to register once if you are going to be staying in the country for more than five days. You have to go the OVR or migration police in order to do this. The migration police apparently have offices at every provincial capital of which there are fourteen. To date I have registered at Aktau, Almaty and Shymkent. In Aktau they are at 123, microdistrict 3, Aktau. They are open Monday to Thursday and Saturday morning. I needed the address of my hotel written down in Cyrillic. In Shymkent they are on Zheltoksan Street – through some setback blue gates. If you ask people around for OVR or migration police they should be able to point you in the right direction. Getting registered here was a bit of a hassle. They didn’t really want to do it and I ended up having to come back twice and didn’t get my passport until 21:00. They seem to be open most days of the week except Sunday. I registered at the Kazakh address of someone I was couchsurfing with. I think doing it with a hotel is easier. In Almaty they are between the buildings of Baytursynuly 61 and 63 and is a large blue building setback from the road. It is near the crossing with Karasay Batyr. Apparently window 3 is the one to go to – it certainly worked for me. In February there was no queue and I had my passport back with registration in 10 minutes. I had the address of a hotel in Cyrillic and they required a copy of my passport as well. In Uzbekistan the registration process is somewhat different. Rather than needing to register once for every time you visit the country technically you should be registered for every night of your stay. In my experience this wasn’t enforced in any manner. Registration is normally carried out by the hotel you are staying at, which makes it easy as you don’t need to go and do it somewhere separately as long as you are staying in a hotel of course. Also not every hotel will register you though and it seems only ones that are licensed to accommodate foreigners will. I have heard that you should aim to be registered at least one in every three nights, sometimes I would go three nights unregistered simply because there were no hotels that catered to foreigners where I was travelling. If I had run into an officious policeman this might have been an issue but all the policemen I met were nice and more curious about me than threatening. At the place I stayed in Tashkent the owner was keen to know where I had been registered right before I arrived, this had been two nights ago in Samarkand. This was OK but I got the impression there may have been an issue if it had been a longer period. In winter the weather is pretty bad in Central Asia as you might expect. Basically I wouldn’t recommend going in winter unless you want to cycle across icy roads through occasional snow and don’t mind being frozen most of the time. That said it didn’t rain, so there are some pluses to it. The police throughout the region were unfailingly polite to me and generally kind. This included the borders. I’ve heard a lot of stories about people being shaken down and being hassled by police. I was very lucky in this regards and didn’t have any trouble. I may have been asked for a bribe at a border but didn’t understand so was waved through. Outside of major towns or cities the internet is very rare. Inside them it is very common and usually high speed. Most tourist guesthouses seemed to have it but non tourist guesthouses didn’t. Cafes in cities in Kazakhstan usually had it and in Bishkek, not so much in Uzbekistan. I found that 3G internet for phones was very readily available and had good coverage and quite fast speeds. The only places where I really struggled to get a signal were in the deserts of Uzbekistan, which you would expect! I would recommend the company Beeline they provide sim cards in Kazakhstan, Kyrgyzstan and Uzbekistan and had good coverage in all of them for good value. I don’t know if it would be worth the effort but Samarkand looked like a very interesting place to visit. Well it was really great to see and I think visiting Uzbekistan off the bike would be a good trip. I’m leaving on a RTW bike tour in a month and am worried about hitting Kazakhstan/China in the dead of winter – November/December/January. When you recommend to avoid it is that because it is dangerously cold, or just uncomfortably cold? Hi Josiah, it sort of depends on what your capable of dealing with. In Kazakhstan and North West China the temperature in winter will get dangerously cold (ie double digits below freezing) . If you’re well prepared then you can certainly make it through as long as the roads are open. If you get into trouble you are on a road as well so you should be able to find someone to help you as there will normally be some vehicles. It comes down to how much of a challenge you want.